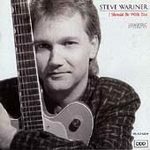 CD review: "I Should Be With You"
Steve Wariner's breezy country-pop is often referred to as light country. But while light, it isn't completely without nutrition. "Runnin'," co-written with Wendy Waldman, is a song with Top 40 crossover potential. A love song, it features Waldman's usual penchant for wanderlust vs. the need for roots. The melody is catchy, the musicianship strong. "Caught Between Your Duty and Your Dream" has the typical country-western approach to dealing with disappointment: "Life ain't fair, but you do what you can to get by." "Somewhere Between Old and New York" is interesting; it's a reminiscent look at the history of that city through its baseball teams. But while the above three songs are excellent, all too often the album slips into banality. "Hold On (A Little Longer)" is a sappy love song that Tony Orlando might even consider a bit much. While Wariner uses songs from excellent composers such as Waldman, Guy Clark and Jimmy Webb, he also includes tunes by less-than-credible composers like Dave Loggins.